my pointless: man takes his anime girlfriend to be his wife. The girl in this picture is adorable, isn't she? Her name is Nene Anegasaki. 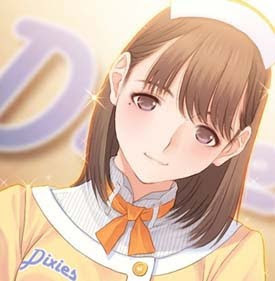 She an Anime character who is part of an online dating simulation game called "Love Plus." Earlier this year, a real Japanese man known only as SAL9000 took Nene (on his Nintendo DS) to the island of Guam. There, he visited a church with Nene and officially married her in the presence of a priest. Love Plus is a game that simulates "real" relationships. Players can date, play games, buy virtual flowers and take moonlight walks with a virtual girlfriend. SAL just took his "relationship" to the next step. Said SAL, "If more people were to find ways of expressing themselves like this, I think it would make society a bit more interesting." The loving couple honeymooned on Guam. They had a ceremony and reception that was broadcast over the Internet. These days, they date around Tokyo (he carries his Nintendo DS with him). Says SAL, "I think I'll probably continue playing Love Plus. I won't cheat." I envision lawyers getting involved in this -- taking steps to protect the rights of this poor Anime character who is now married to a very odd man.